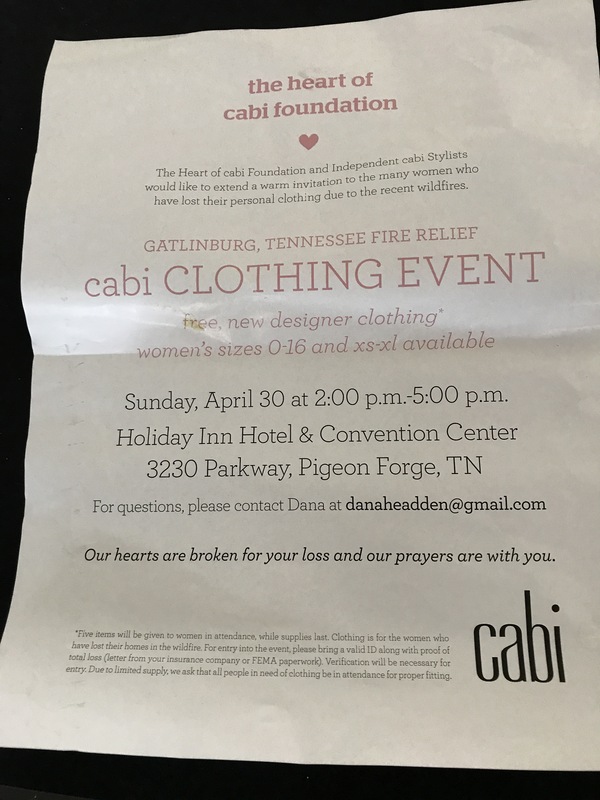 Last Sunday, the Cabi clothing company distributed almost 1,600 pieces of clothing to help women who had lost everything in the Gatlinburg wildfires last year. 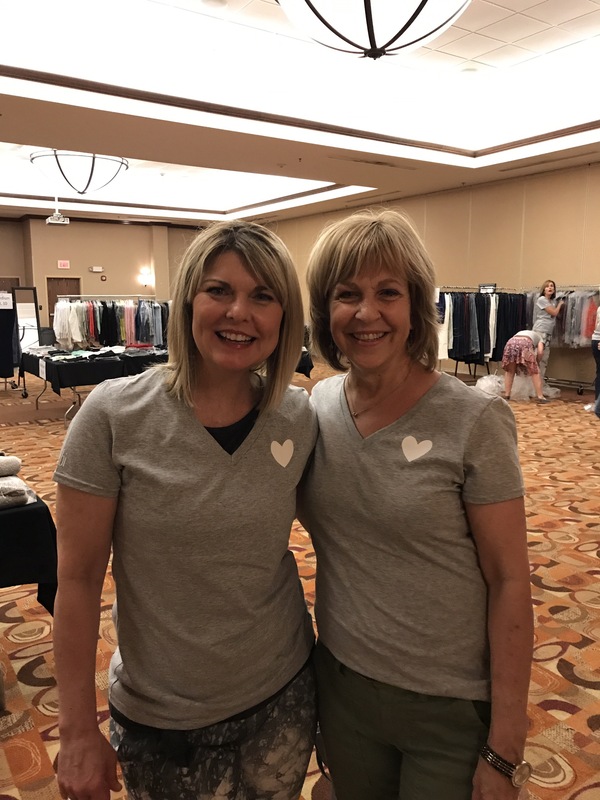 The company designs and sells women’s clothing so their foundation strives to assist and empower women. As a Cabi collector/fanatic myself, I knew this, but was still impressed that they would come to our area to help. 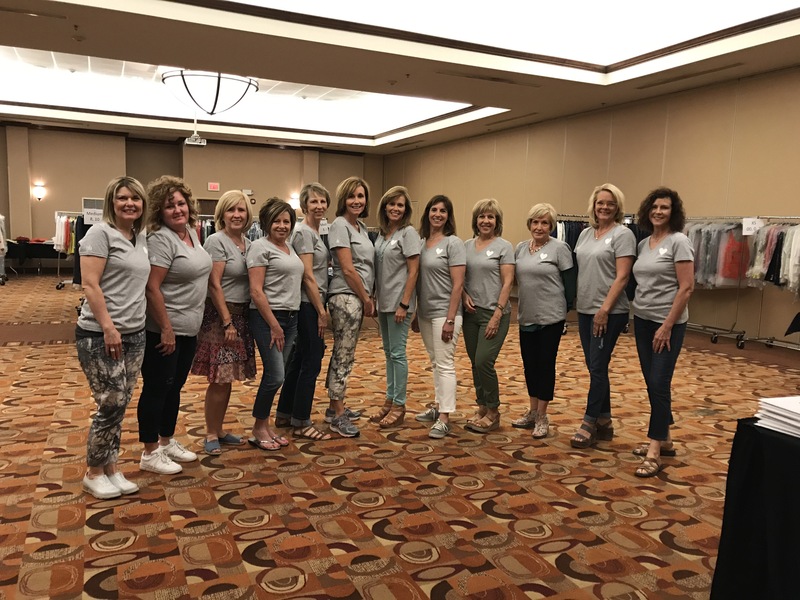 Taking a chance tthat they would let me cover the story for this blog, I went to the Holiday Inn in Pigeon Forge on Sunday morning to check it out. Not only did they allow me to cover the story, I was able to stay and lend a hand. What an amazing day! Here is what happened. 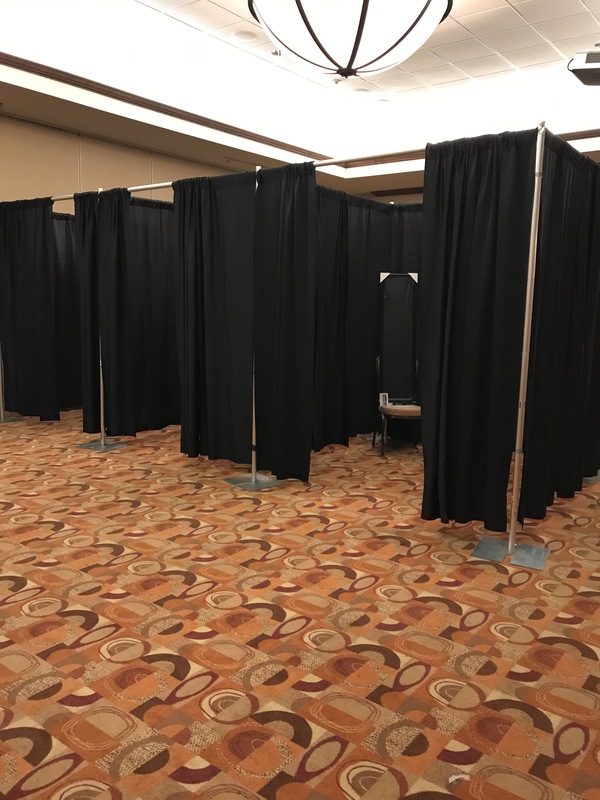 I asked the desk clerk if the event was in the conference area, then headed over there. 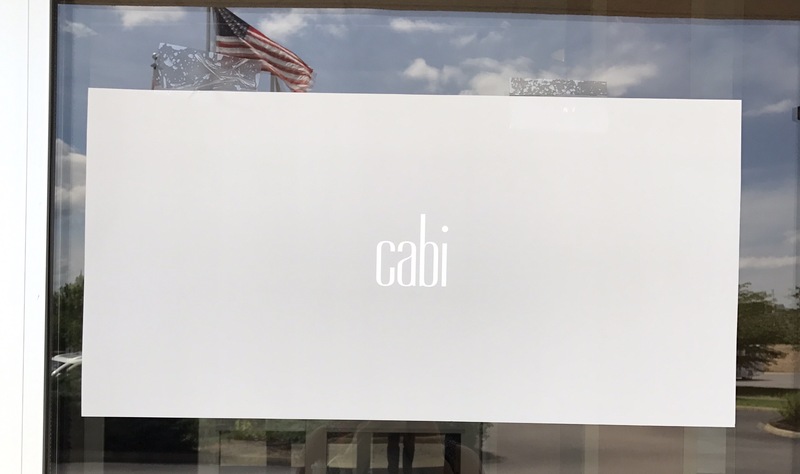 I saw the Cabi logo and knew it was the right place. 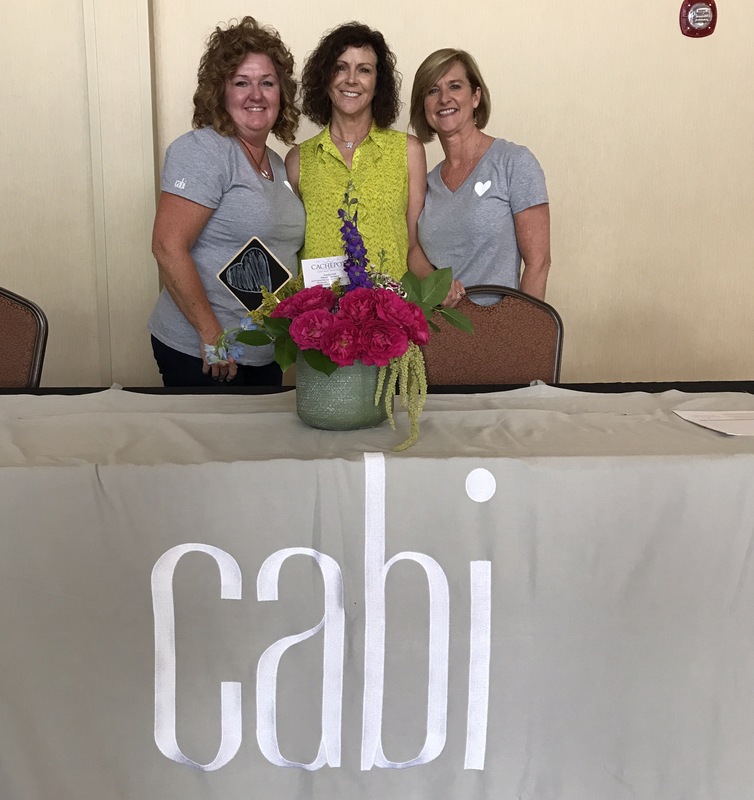 Cabi stands for Carol Anderson by invitation,’ after the company founder. She worked at Nordstrom at one time, then decided to start her own company. 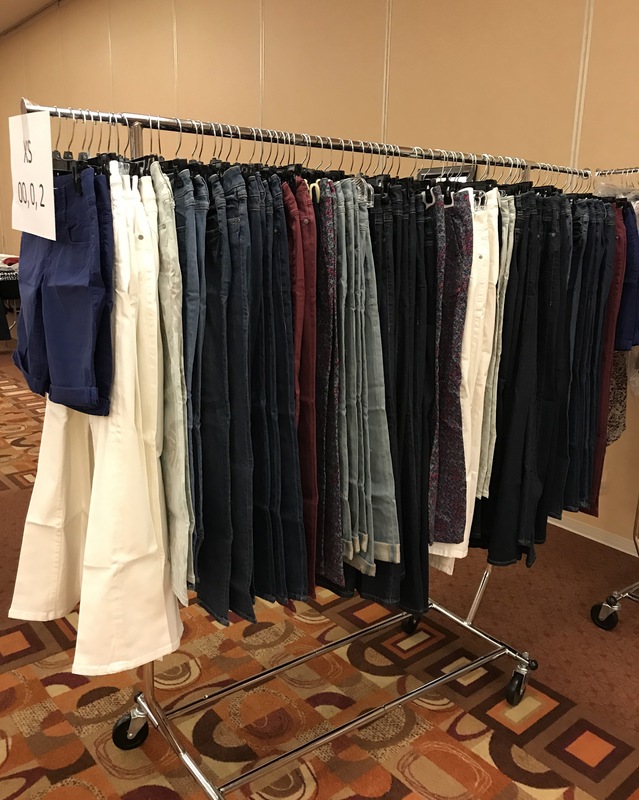 I have been a fan for over a year so I knew that this clothing event was a big deal. 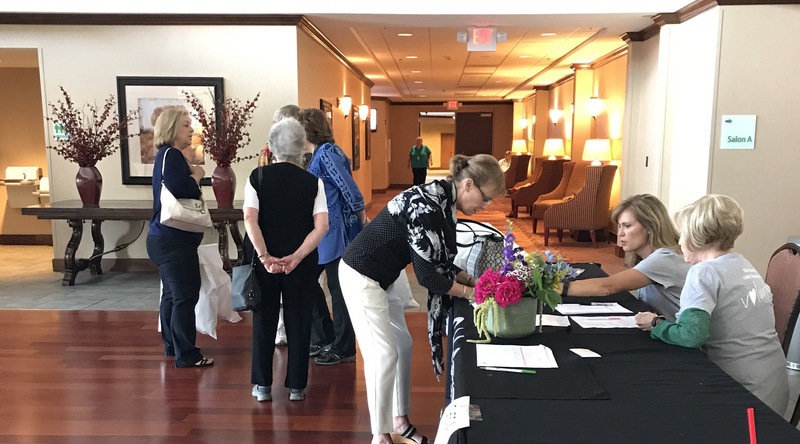 After signing in, ladies would come into this waiting room until a stylist could help them shop. Each was greeted warmly and they exchanged names, resulting in a wonderful, personal touch. The shopping was divided into areas according to size. 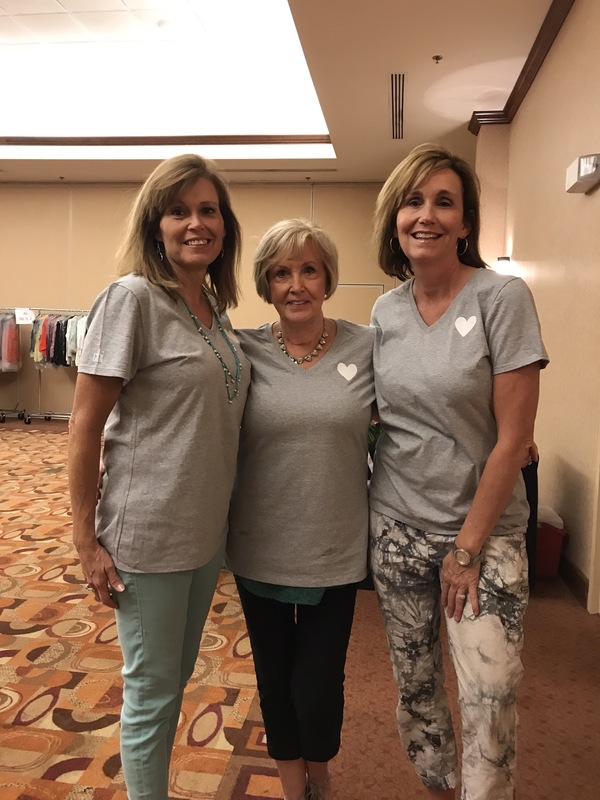 The volunteers wore Heart of Cabi T-shirts sent by the company to help identify the helpers and stylists. 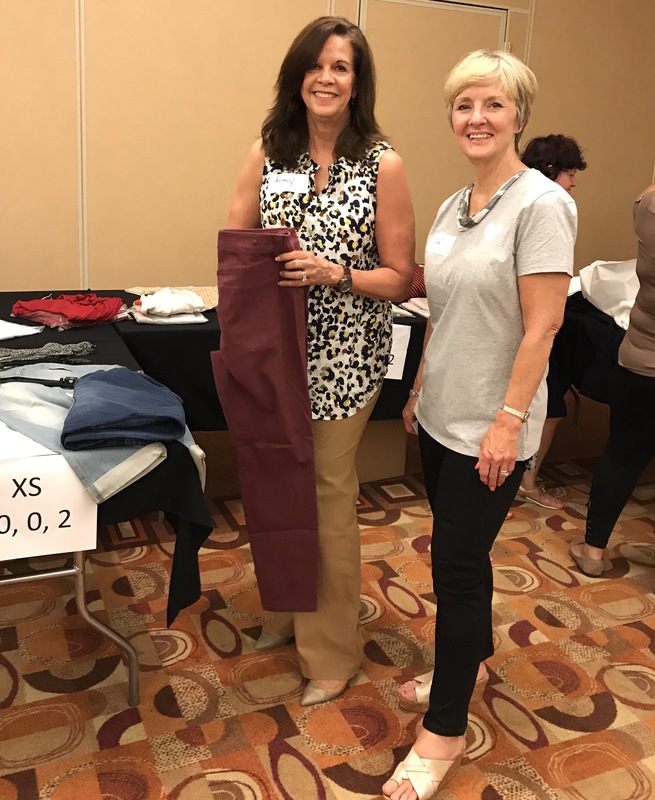 Stylists pictured here from left to right are Lisa Bitzas, from Seymour, and Diane Beshears, from Knoxville. Does Lisa’s name sound familiar? She is a music teacher in Seymour who is married to George Bitzas, the incredible tenor who has sung the National Anthem for the Vols football games. A Vol fan, I was thrilled to learn this fact! 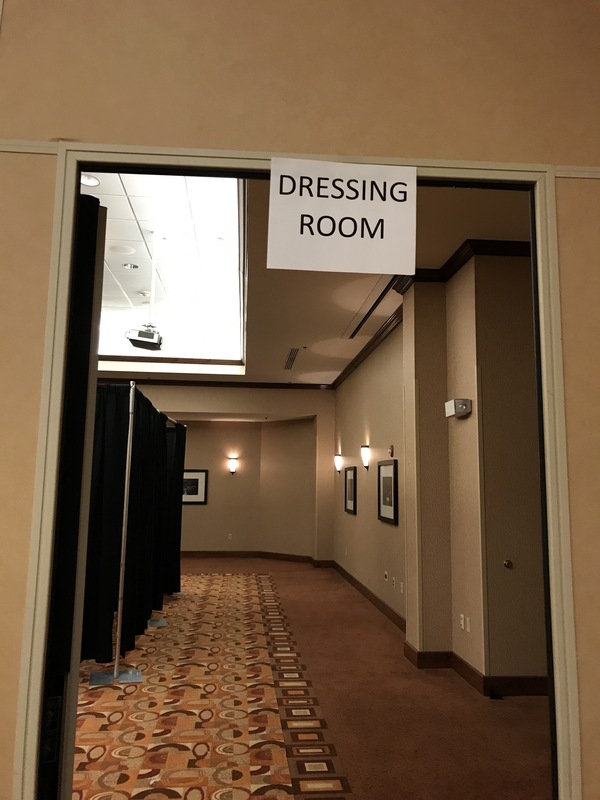 The hotel was able to help set up dressing rooms for the ladies. This was invaluable. I took this photo of two sisters and their mother, Angela Farmer, Margie Atherton, and Amy Keck. 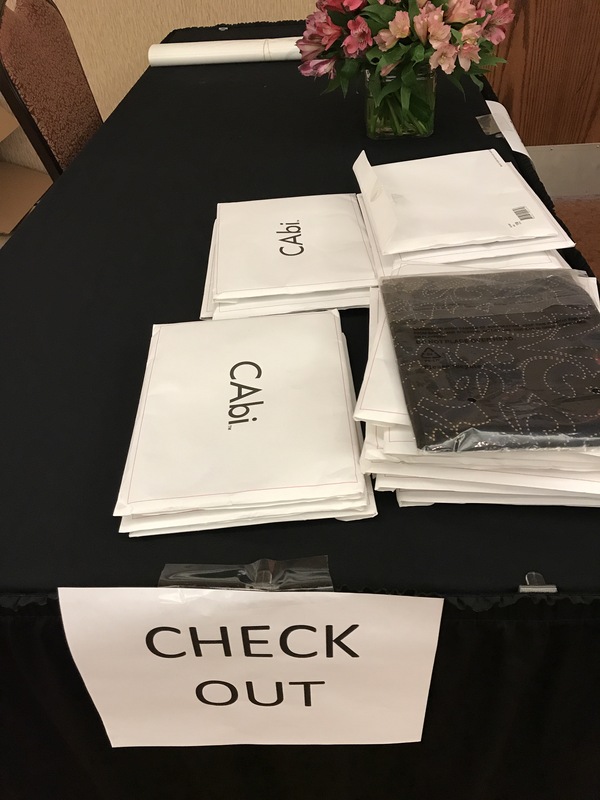 Check-in was easy and smooth. With each arrival, I could sense that the shoppers had been through a terrible ordeal, yet had great resilience. I heard bits of their stories of that frightening night. Pregnant mothers almost trapped on the mountain as their husbands were stuck in town. A lady told of looking out her window that evening to see fire quickly approaching the home and recounted their escape. Several Latina ladies told of leaving their homes with only the clothes on their backs, with no change of clothing. Not even a change of underwear. This was an invitation and announcement for the clothing event. 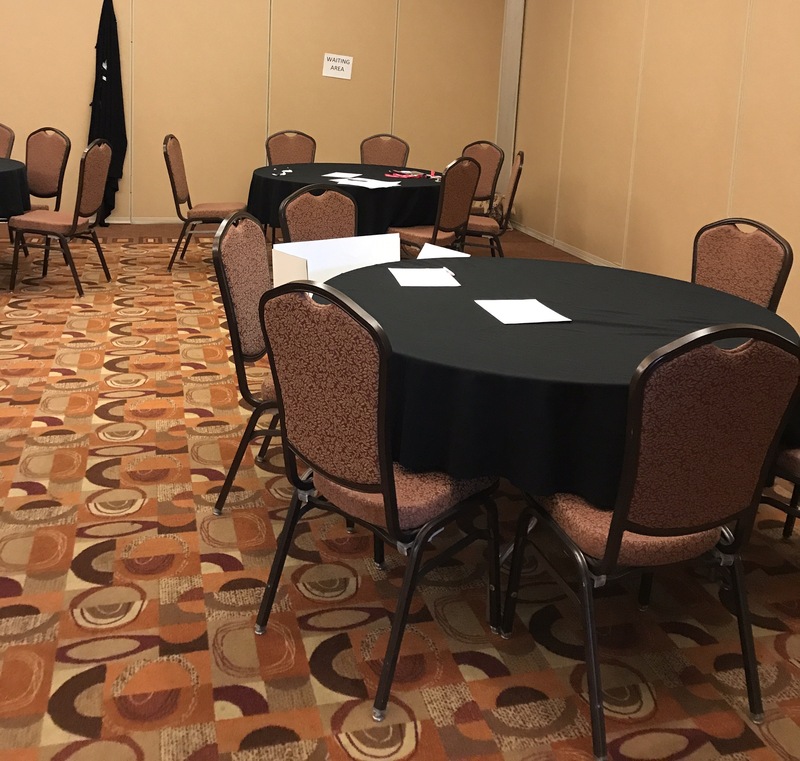 Many participants had it in hand as they walked through the door. I ended up staying for the entire event in order to interpret for Spanish speaking victims of the wildfires. Several of the older Latina ladies were so happy with their new clothes and told me that they were going to wear them to church. 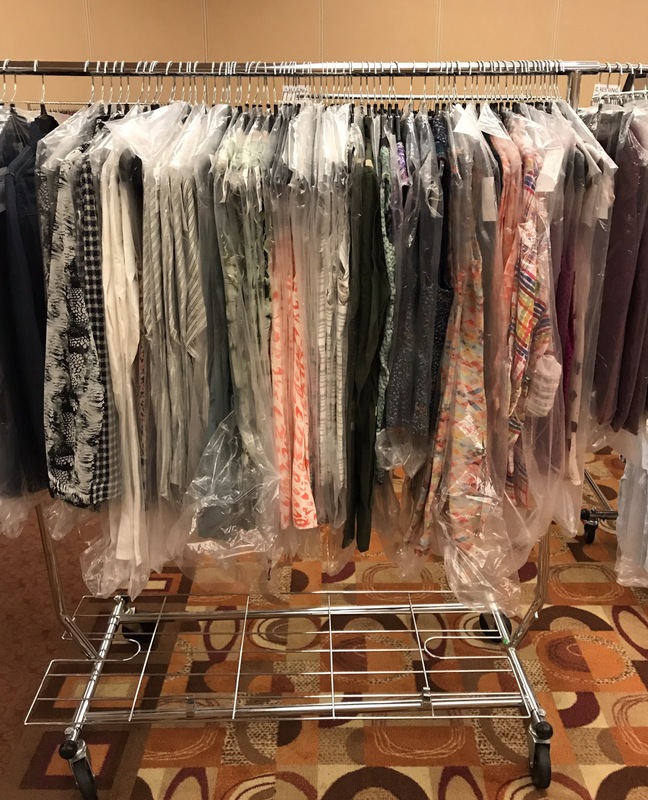 Stylists are ready to assist shoppers. Event organizer, Dana Headden, is pictured on the left. 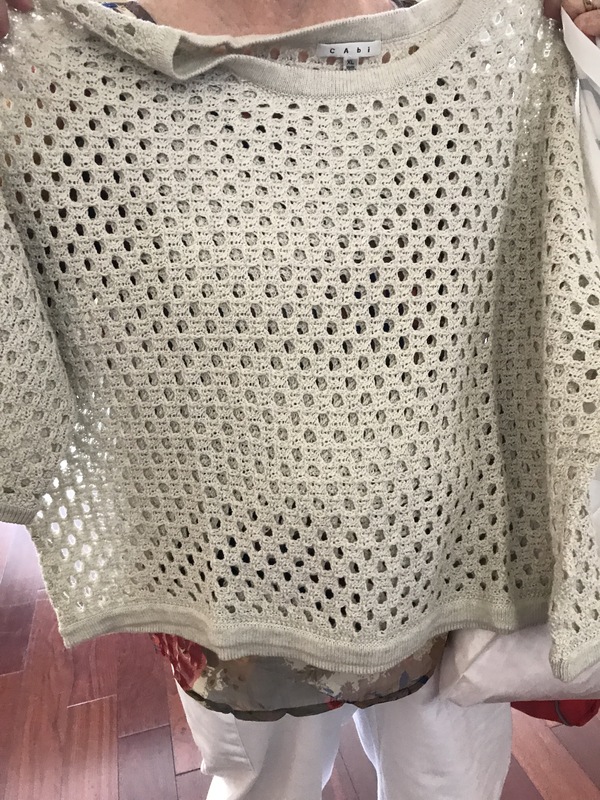 A retired teacher from Pi Phi was delighted with her Oatmeal sweater. As she left, the teacher said, “Something new gives you a lift. It made my day.” Her friend departed, saying “thank you so much. 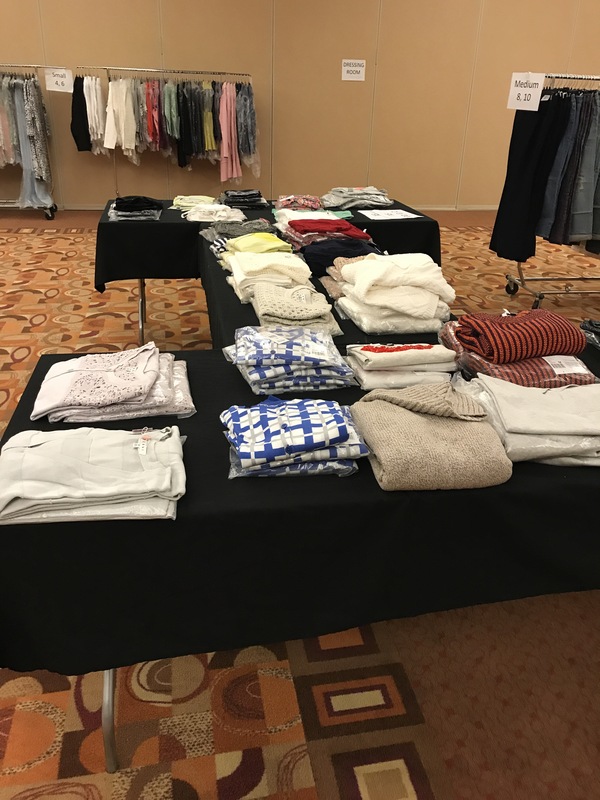 We appreciate it.” A shopping helper told me that the shoppers came out of dressing rooms either crying or saying how thankful they were. Two volunteer helpers were from our community. 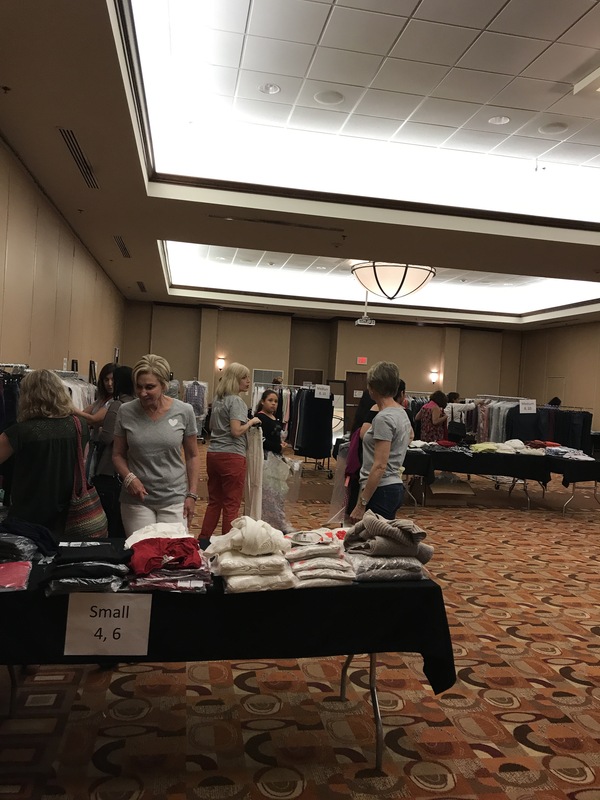 I saw Amy Harper and Cheri Schmutzer assisting many ladies at the event. There was not a lot of time to talk, but I quickly determined that Amy and Cheri are Cabi fans too. 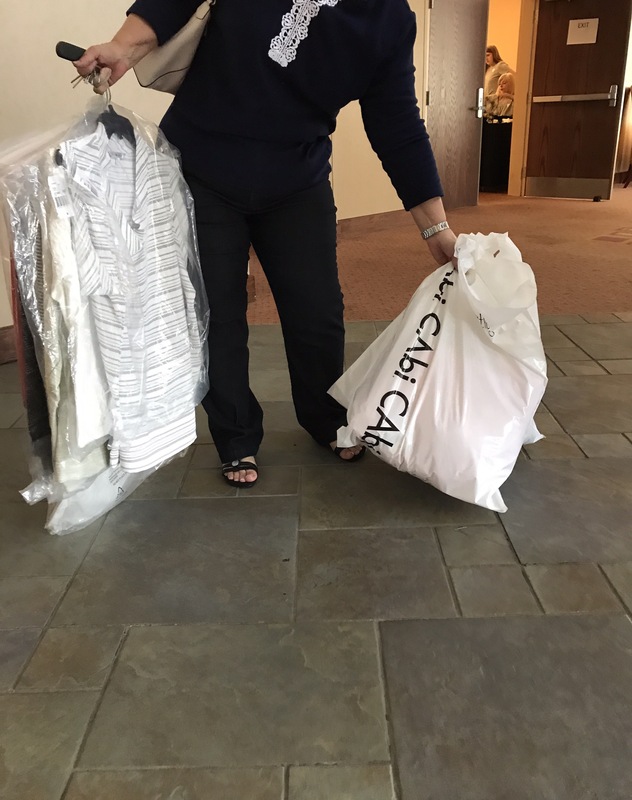 On a humorous note, one husband looked at his wife’s bags, looked at us, and asked, “so who do I thank for losing my side of the closet?’ We laughed. 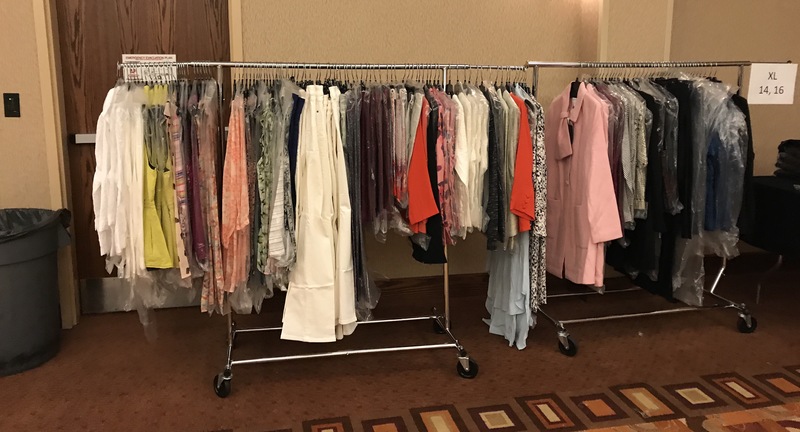 By the end of the event, Cabi had given away almost 1,600 pieces of clothing. 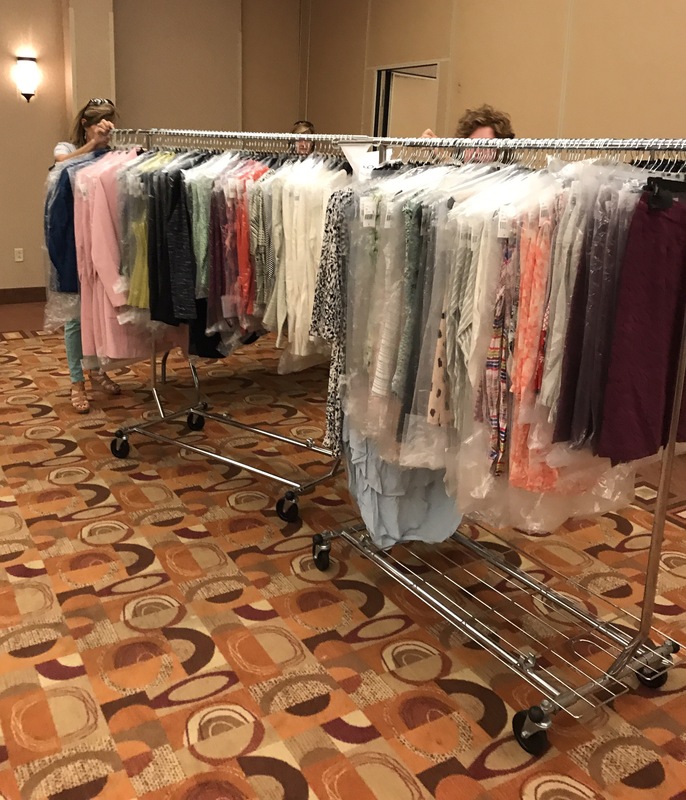 What little remained was donated to A Hand Up For Women, a charity in Knoxville. Only about 200 pieces remained, the rest went home with those who lost everything in the December wildfires. 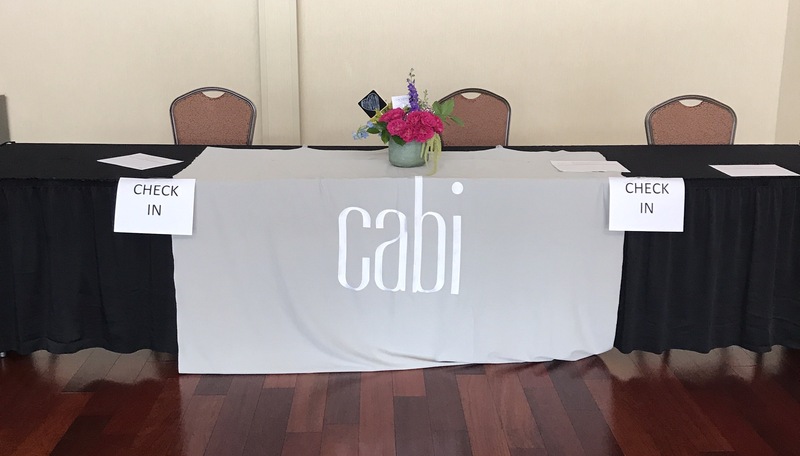 The Cabi stylists ready to help before the event. With many thanks, from Sevier County. We will never forget the wildfire that ravaged parts of our county last night. I generally blog about happy things, but felt compelled to get out and about today after the tragic losses to see what was going on. In just a couple of hours, I was able to see various examples of Sevierville wildfire response. There were many, many people mobilizing help and assistance. Here are just a few that I saw today. When we saw video of the Spur (the road between Pigeon Forge and Gatlinburg) on fire last night, I know that a lot of us panicked thinking of the Humane Society in that area. Fortunately, they had mobilized and evacuated pets to the Young Williams Animal Center in Knoxville. In the meantime, they have mobilized a temporary shelter at the Sevierville Fairgrounds. I made a visit this afternoon and found it ready for incoming animals. Actually, there was a large contingent of volunteers helping the Humane Society prepare the fairground buildings, one for dogs and one for cats. When I arrived, they were unloading big packs of newspaper which looked like donations from the Knoxville News Sentinel. The Sevier County Humane Society was prepared and ready for intake. Audrey, above, came from Asheville to drop off kennels and crates for the Humane Society. Thank you! Last night, the Barker Lounge posted on Facebook that they could take in pets who needed shelter. I stopped by today to see how they were doing. There were many volunteers who had mobilized to accept the many item drop offs. The volunteer told me that they began taking in pets last night about 8:00 p.m. and stayed throughout the night. Barker Lounge ended up with 40-50 (mostly) dogs and 3 cats of locals, tourists, those who had lost their homes. The volunteer allowed me into a room that I have seen used for storage and training, but now giving shelter to some of the pets. It was feeding time so all was quiet and pets seemed content considering the circumstances that had brought them here. They were very well taken care of. A few cats were chilling out in their area. I asked what they needed at the Barker Lounge and here is the what they said this afternoon: feeding bowls, 30 gallon contractor trash bags, and canned chicken for animals with delicate digestive needs. Next, I dropped by First Baptist Church of Sevierville because I remembered that they had been cooking for the LeConte Center shelter this morning. 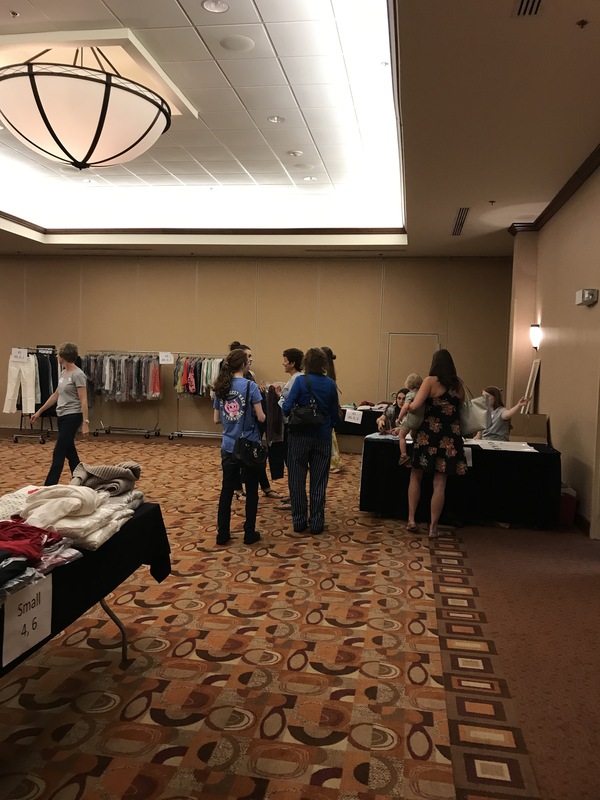 According to the guys that I talked to, church members had cooked hundreds of hot dogs that morning, but volunteers had mobilized to the LeConte Convention Center this afternoon to help on site. On the way out, I passed by the downtown Sevierville Fire Station and stopped for a minute. They were loading a huge pallet of water to take to the Command Center at Rocky Top Sports World, the command center for the fire scene. Captain Atchley is a 1987 alum of SCHS. His great grandfather was Fred C. Atchley and he is a cousin to Jim Atchley. That, my friends, is a firefighter pedigree! Captain Atchley spent last night in the upper end of Gatlinburg on a ladder truck inspecting buildings. He said that it was very intense. Interestingly, before I left, two senior citizens pulled in up their car to talk to him a moment. I heard them ask him directions to the Apple Barn Restaurant. When they left, I asked if people stopped by to ask directions a lot. He smiled and replied, “yes, all the time.” At this moment, I remember that I have done that three times myself. Next, I moved on to Sevierville Primary School to donate to a family who had lost everything in the fires. Two teachers had mentioned the need on Facebook and were at the school from 3:00-6:00 to accept anything that could be donated. People had clearly responded to the request. I was happy to see that Becca and Ashley had several bags of good things to give them this evening. My last stop was the DreamMore Resort by Dollywood because the fire had looked so close to it last night in the pictures that I saw on Facebook. All looked well and I saw no sign of singeing or burned vegetation. But it looked like they are not taking chances tonight. No parking near the tree line. I only had a couple of hours to get out and about in Sevierville today, but there was a lot of activity going on to assist our neighbors nearby. Pray for our friends in Sevier County.